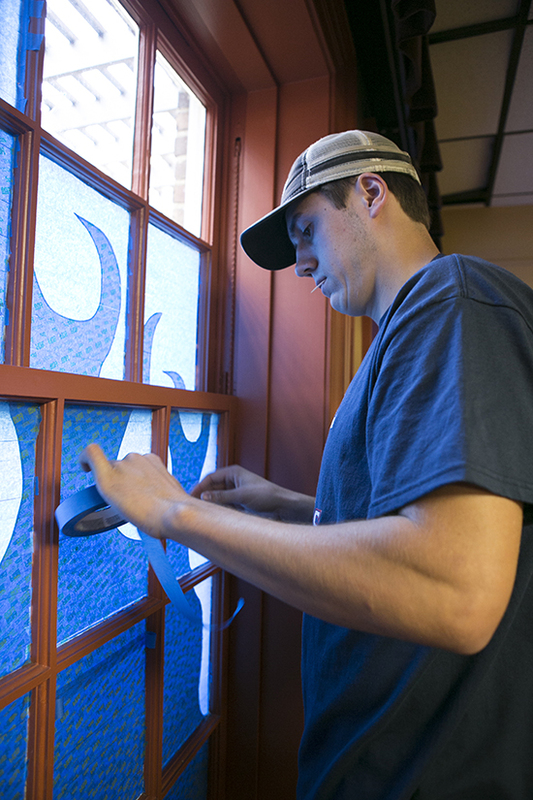 Thanks to Samford University School of the Arts students, 36 windows across campus recently were given a temporary “stained glass” treatment with blue painters tape. The students spent a day in the classroom practicing with the material and then were each given their own window on campus to cover. Stephen Watson, assistant professor of art, was one of the faculty members who coordinated the project. The painters tape, when applied in layers, creates a “stained glass” window effect. Depending on the time of day, the designs can be seen from either the outside or the inside. Celia Gannaway, a freshman interior design and interior architecture major from Decatur, Alabama, was responsible for a window in the Beeson University Center. For more information about the School of the Arts, visit www.samford.edu/arts.